Lineage. Constituted 18 Bombardment Squadron (Heavy) on 20 Nov 1940. Activated on 15 Jan 1941. Redesignated 18 Bombardment Squadron, Heavy, on 20 Aug 1943. Inactivated on 28 Aug 1945. Consolidated (19 Sep 1985) with the 18 Special Operations Squadron, which was constituted on 18 Jan 1969. Activated on 25 Jan 1969. Inactivated on 31 Dec 1972. Redesignated 18 Test Squadron on 1 Jul 1991. Activated on 15 Jul 1991. 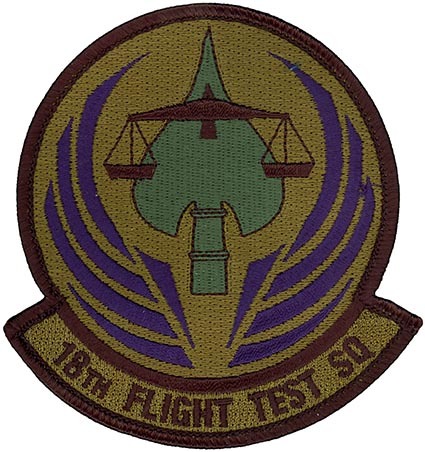 Redesignated 18 Flight Test Squadron on 23 Mar 1994. Inactivated on 1 Apr 1994. Activated on 1 Apr 1994. Assignments. 34 Bombardment Group, 15 Jan 1941-28 Aug 1945. 1 Special Operations Wing, 25 Jan 1969; 4410 Combat Crew Training Wing, 15 Jul 1969; 14 Special Operations Wing, 1 Oct 1969; 56 Special Operations Wing, 25 Aug 1971-31 Dec 1972. Special Missions Operational Test and Evaluation Center, 15 Jul 1991-1 Apr 1994. Air Force Special Operations Command, 1 Apr 1994; Twenty-Third Air Force (Air Forces Special Operations Forces), 1 Jan 2008-. Stations. Langley Field, VA, 15 Jan 1941; Westover Field, MA, 29 May 1941; Pendleton Field, OR, 27 Jan 1942; Davis-Monthan Field, AZ, 13 May 1942; Geiger Field, WA, 4 Jul 1942; Ephrata AAB, WA, 1 Dec 1942; Blythe AAFld, CA, 7 Dec 1942; Salinas AAB, CA, c. 29 May 1943 (operated from Kern Co Aprt, Bakersfield, CA, 22 Jun-13 Jul 1943); Blythe AAFld, CA, 13 Jul 1943-c. 2 Apr 1944; Mendlesham, England, 23 Apr 1944-24 Jul 1945; Sioux Falls AAFld, SD, c. 13-28 Aug 1945. Lockbourne AFB, OH, 25 Jan-1 Oct 1969; Phan Rang AB, South Vietnam, Oct 1969; Nakhon Phanom RTAFB, Thailand, 25 Aug 1971-31 Dec 1972. Edwards AFB, CA, 15 Jul 1991-1 Apr 1994. Hurlburt Field, FL, 1 Apr 1994-. Aircraft. PT-17, 1941; LB-30, 1941; B-18, 1941; B-17, 1941-1943, 1944-1945; B-24, 1943-1944. AC-119, 1969-1972. AC-130, 1991-1994. AC-130, 1994-; MC-130, 1994-; MH-53, 1994-. Operations. Antisubmarine patrols, Dec 1941-Oct 1942. Combat in European Theater of Operations (ETO), 23 May 1944-20 Apr 1945. Combat in Southeast Asia, 13 Nov 1969-2 Nov 1972. Tested development of the AC-130U, Jul 1991-1994. Tested and evaluated all assigned Air Force Special Operations Command aircraft and associated equipment, 1994-. Campaign Streamers. World War II: Antisubmarine, American Theater; Air Offensive, Europe; Normandy; Northern France; Rhineland; Central Europe; Air Combat, EAME Theater. Vietnam: Vietnam Summer-Fall, 1969; Vietnam Winter-Spring, 1970; Sanctuary Counteroffensive; Southwest Monsoon; Commando Hunt V; Commando Hunt VI; Commando Hunt VII; Vietnam Ceasefire. Decorations. Presidential Unit Citation: Southeast Asia, 1 Apr-31 Dec 1972. Air Force Outstanding Unit Awards With Combat “V” Device: 1 Jul 1970-30 Jun 1971; 25 Aug-30 Nov 1971; 1 Dec 1971-29 Feb 1972; 8 Apr-13 May 1972. Air Force Outstanding Unit Awards: 1 Jun 1995-31 Aug 1996; 1 Sep 1996-31 Aug 1997; 1 Sep 1999-31 Aug 2001; 1 Sep 2001-31 Aug 2003; 1 Sep 2003-30 Sep 2004; 1 Oct 2004-30 Sep 2005; 1 Oct 2005-30 Sep 2006. Republic of Vietnam Gallantry Cross with Palm: [Oct] 1969-31 Dec 1972. Emblem. Approved on 13 Jul 1992.